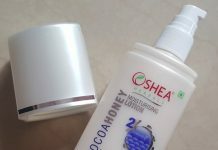 Here’s the list of top 10 fairness creams currently available in the Indian market at affordable prices. 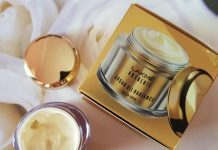 It is enriched with beautifying extracts like saffron, liquorice, bearberry fruit and bio-white, this cream nourishes your skin from within. It helps lighten the skin tone and renews the skin cells. This fairness cream from OxyGlow gives you natural fairness without any harmful effects of chemicals on your skin. This fairness cream is rich in antioxidants which makes it effective in reducing melanin secretion and brings out speedy cell renewal, providing you a natural and healthy fairness. With a SPF 15 formulation, this cream also provides protection from harmful sun rays. Use this cream everyday for a healthy glow on your face. This fairness cream provides a glowing fairness. It contains a unique formula that gently removes the dead cell and moisturizes skin deeply. Comprising essences of saffron, bearberry, liquorice and arbutin, it helps reduce melanin and lightens the skin tone effectively. Made of rich natural ingredients, this cream highlights the natural fairness of the skin. 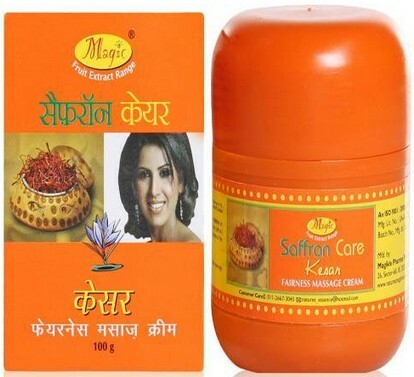 Apply this fairness cream daily for a lighter skin tone and healthy skin. It is an ayurvedic fairness massage cream with anti aging properties that maintains the elasticity and firmness of the skin. It also reduces dryness and improves texture. Use required cream all over the face after thorough cleansing and gently massage for 5-7 minutes for desired results. 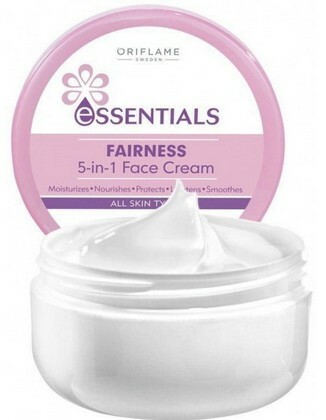 Oriflame’s Essentials Fairness 5 in 1 face cream’s multi-action cleansing formula moisturizes, brightens and prevents UV-induced pigmentation. 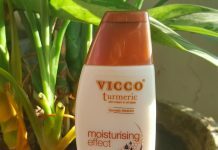 It is enriched with skin lightening complex, vitamin E and SPF8. It also helps control excessive oil and is suitable for all skin types. It is a light fast–absorbing cream that leaves skin looking visibly fairer in 2 weeks. For best results, apply to face & neck twice a day after cleansing. Vaadi Fairness Moisturiser with Mandarin Extract performs the dual action of lightening the skin-tone as well as deep-moisturizing it. On the other hand, the Silk Extract works from the inside, by controlling the production of skin-darkening pigment (melanin). As a whole these natural ingredients provides you a softer, smoother skin & fairer complexion. Should be applied once or twice daily. 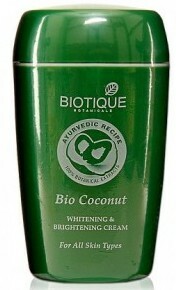 Bio Coconut Whitening & Brightening Cream from Biotique comes with the goodness of pure virgin coconut that deduces dark spots and blemishes, lightens your skin tone and enables skin to be bright, soft and supple. Free of chemicals, this fairness cream makes sure that your skin is nourished deeply along with healthy and natural fairness. For best and faster visible results, this cream must be applied on cleansed skin twice a day. Blended with the extracts of Tea Tree and Liquorice, this Lotus Herbals Fairness Gel infuses life into dull skin to make it healthy and radiant from within. The natural skin toning properties of Tea Tree extracts eliminates rough patches from the skin to give you a smooth and even skin tone. In addition, by restoring the lost pH balance to your skin, Tea Tree keeps your skin soft and supple. This oil-free facial fairness gel also protects your skin from external impurities and microbes with the help of the anti-bacterial property of the Liquorice extracts infused in it. This anti-aging Lotus Herbals Face Gel revitalizes cutaneous cells effectively preventing aging. Use regularly at least for two weeks for best results. Khadi Lavender Herbal Fairness Lotion’s unique formulation with herbal ingredients provides vital nourishment to the skin and also helps in reduction of the melanin in the skin without changing the skin’s herbal balance. This lotion is enriched with shea butter, which will keep your skin moisturized without making it oily. On the other hand, Lavender accentuate your face and remove blemishes & spots. It’s natural action removes dead skin and revitalizes skin cells, giving you fair, younger looking skin. Apply the lotion all over the cleansed face in circular motion twice a day for best results. 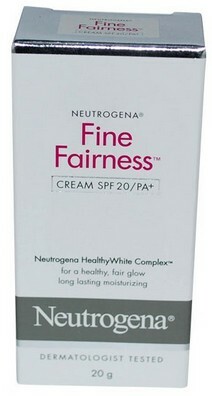 Neutrogena Fine Fairness Cream with SPF 20/PA+ is a daily moisturizing whitening cream that helps whiten skin from within & provides UVA/UVB sun protection, for a fair, healthy and radiant skin. It promotes fairness and helps reduce the appearance of melanin and uneven pigmentation. It also Delivers long-lasting moisturization. Use daily for optimum effect and smoother skin. Enriched with VAO-B3 complex and multiple UV sunscreens, this moisturizing day cream helps in reducing marks and thus leave you with a more nourished and fairer skin. It results in luminous and flawlessly radiant skin that is also protected from the harmful UVA/UVB rays. 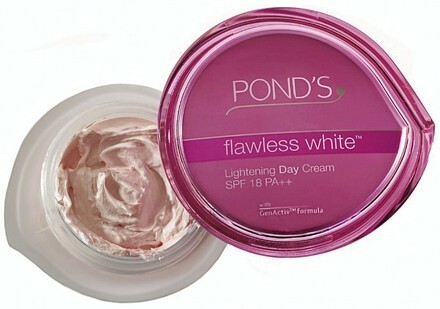 Pond’s Flawless White Daily Cream works well on the dark spots & blemishes which needs more lightening. For best results use every morning and evening after cleansing your skin. Hi I May like to go ahead to buy khadi lotion. are sushma app ko kahta hu gehu ka ata haldi or limbu ka pest bana ke lagav fir kehna muje kya result he 100%%%%%. I used ponds flawless radiance.. its really works.. during pregnancy i became dark.. so i started using after delivery.. i didnt get my fair as before but it gives some result in one month.. so i think if i use it for some more months i can get back my fair as i was before pregnant..
agr ap fair dikhna chahti ho to my fair cream use kre. I was use pond`s cream but I think its not work .my skin so oily and dark so please give me good suggestion or cream. Sir meri skin oily h 2 year phle meri chin burn ho gyi thi mene bahut dawa karwayi lekin nishan nhi gye meri shadi hone wali h koi esi cream batayein jisse meri samsya solve ho s ke .